One of the most popular herb seasonings used in cooking, rosemary may also have a positive effect on overall health. For centuries, people living in the southern part of Europe have used this plant for a variety of medicinal applications. Although medical science has yet to verify the effectiveness of rosemary when used as a healing compound, millions of natural herb enthusiasts give testimonials filled with positive criticism. 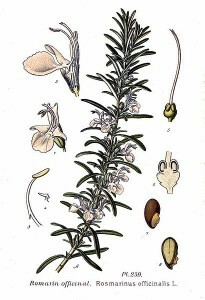 Rosemary is a shrub native to the Mediterranean region. It grows several feet tall and produces clusters of blossoms and oblong seeds. The leaves are needle-like, resembling those of spruce or fir trees. These are often ground into a powder and used to season foods, particularly beef and lamb. Since the days of the ancient Egyptians, rosemary has been used as a stimulant. The needle leaves contain oil that can be extracted and concentrated. The oil can then be diluted in water and ingested. Rosemary is a natural diuretic. A diuretic – sometimes called a water pill – is taken by those who wish to control their blood pressure. However, rosemary is made up of complex compounds, many of which are concentrated in the plant oil. Taking this herb can aid in blood circulation because the effect is one of a natural stimulant. Blood circulation aids are of particular interest to those who have high blood pressure and are overweight. Diuretics are also taken by those who have had heart or kidney problems. Hypotension is a term used to define abnormally low blood pressure. The phytochemicals found in rosemary have an effect on the circulatory system. Besides stimulating blood vessels near the skin- especially the smaller capillary vessels – the chemicals found in rosemary act as an overall stimulant. The effect is actually rather mild, much more so than prescription medications given to those who suffer from hypotension. There is no single cause of hypotension. Many individuals have low blood pressure because of their unusually large arteries. Those with a slow or faint heartbeat also have lower blood pressure. Rosemary does not speed up the heart rate, nor does it act as an adrenal stimulant. What it does is stimulate blood flow to every capillary in the body. Rosemary does not appear to raise blood pressure in those with hypotension. Instead, it acts more like a catalyst, allowing other bodily systems to function in a more desirable state. Some people take rosemary to control hypertension, but medical experts have come to the conclusion that the herb can do more harm than good for those who have extremely high blood pressure. Diuretics in general remove excess water and salt from the body, and rosemary accomplishes this as well. However, the stimulation effect can become dangerous if the individual has certain other health problems or is already taking pharmaceutical drugs to aid in managing their hypertension. Taking rosemary in combination with prescribed diuretics can actually result in dehydration. More recently, rosemary has been used as a treatment for hair loss. The medical community is rather split as to the reason for the effectiveness, but most research studies have concluded that it does indeed help recharge worn-out follicles. The herb has an irritating effect that increases blood flow near the skin surface. People with eczema often use rosemary as an aid in reducing pain and swelling. It is theorized that rosemary can actually stimulate blood flow in the brain. Several studies have found that taking the herb on a daily basis may help in slowing the process of senility and memory loss. Although this has yet to be proven by medical science, rosemary is nonetheless taken by countless people worldwide who have entered their elderly years and who have heard of this claim. Rosemary has been used to relieve heartburn, decrease flatulence, eliminate headache pain, and even control the pain symptoms associated with sciatica. As a pain reliever, rosemary has been proven to be an effective treatment for muscle discomfort. It also seems to aid in the release of toxin buildup in fat cells and along the neural pathways. The oils found in rosemary are used as an ingredient in specialized bath soaps. Most bath therapies include using soaps that contain rosemary oil. Rosemary can be used as a spice for food. The herb is available in both needle and crushed form. Most people use rosemary to season meats, but it can be a flavorful addition to vegetables as well. The herb is sold in health food stores in the form of capsules or caplets. The capsules contain concentrated rosemary oil. Some manufacturers also produce teas that contain rosemary leaves or extract. Before taking rosemary as a health-enhancing supplement, individuals should consult with their doctor. Rosemary interacts with a number of pharmaceutical drugs, especially those that increase blood flow or stimulate the circulatory system in general. Thank u so much. I couldnt figure out why i couldn’t sleep. U already take highblood meds. Coupled with that i was using rosemary in my meats and salads. My blood pressure is 110 over 57. It is too low in rhe low end causing me ti exoerience hypertension. Thank God i listened ri one of my co-workers when she told me my bloodpressure was too low. So many sleepless nights. Do not play with with rosemary.